100% Vegan Vitamin D Supports Bone Health! Meat and fish are the most common sources of Vitamin D3 in the diet, and most supplemental D3 is typically extracted from sheep's wool (Lanolin) or other animal sources. For this reason, Vitamin D3 supplements have historically not been suitable for either vegetarians or vegans. 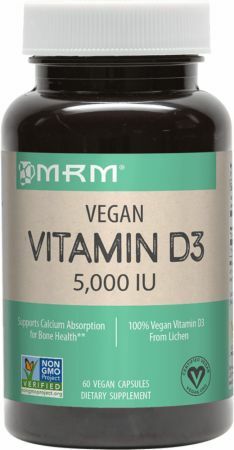 MRM Vegan Vitamin D3 is a unique micro-encapsulated Cholecalciferol form of Vitamin D3 that is extracted exclusively from lichens, to support calcium and bone health needs of both vegans and vegetarians. Necessary for the efficient utilization of calcium, this vegan-friendly D3 aids in the formation and maintenance of strong healthy bones. * Vitamin D3 also promotes immune function. * Numerous published research studies suggest that Vitamin D3 (Cholecalciferol) is the best possible form of Vitamin D for the body. Guaranteed GMO-Free, it is the world's only Vegetarian Society and Vegan Society registered Vitamin D3, and contains Cholecalciferol that is free from sugar, wheat, egg, gluten, peanut, tree nut, fish, shellfish, soy, and dairy products. I noticed that the D3 I was using before this one had soy and other additives. I am glad I found this product line since MRM supplements are so clean and simple. Just what I need and nothing that I do not need. Rice Flour, Cellulose Capsule, Maltodextrin, Unmodified Food Starch, Sucrose, Silicon Dioxide, and Antioxidants (D-Alpha Tocopherol, and Ascorbyl Palmitate). Directions For Vegan Vitamin D3: As a dietary supplement, take 1 capsule daily or as directed by your qualified healthcare provider.